Everything is changing to USB C – great! But also, eek. That means it’s time for new chargers. Now, I’ll grant you, I’m a nerd and I love shopping for new chargers! But trying to find one I want, that charges the devices I want, which can be shipped to me (Austria uses Amazon Germany, and as many residents of Austria are aware, lots of things “Cannot be shipped to Austria” – for reasons unknown) is actually not that fun after 3 hours of trying to figure it all out. My primary search criteria over the last few months has been “more than one USB C port”, this has been a challenge, to say the least. One of the things I decided I was willing to capitulate on early on was that it should also be able to charge my MacBook Pro. I love my 15″ device, but in hindsight maybe I should have gone 13″ – as then it just needs 60W of power. But as a friend said not long ago, when does the 15″ really need 87W of power? For intensive things yes, but for writing scripts, blog posts, even running MAMP as my virtual server? Not so much. Then CES happened. As always, there were lots of shinies – some of which are weird and probably won’t be seen or heard from again. However, there were also the “ready to ship” things, including a new charger from Satechi. This charger is the success to my previous Anker 5 port charger – one of those ports being a USB C PD port. 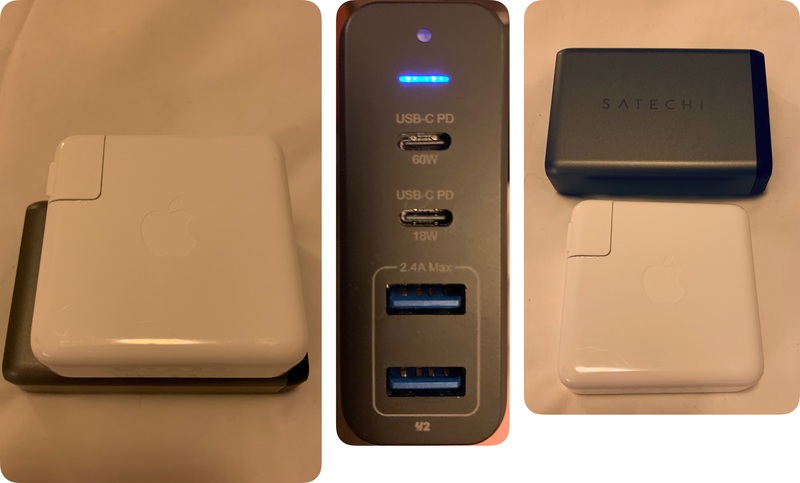 The Satechi though, has 2 USB C ports, one 60W, one 18W (handily noted in very small font below the ports), and 2 USB A ports. So technically I’m losing a port – but as I always take a small single USB A port device with me for use in the airport I can manage if I really need 5 ports at once. I’ve been putting the charger through its paces since I got it on Tuesday, and I’m impressed. I’ve been using the 60W port for my MacBook Pro, it works, it’s a little slower than the 87W when the device is in use – but I can live with that. The 18W has been used for my iPad Pro and Nintendo Switch, it works great – they both charge quickly with no issues. The other two ports have an Apple Watch cable plugged in, and an Anker 3 in 1 cable (Micro USB, Lightning, USB C), the latter for charging my iPhone, AirPods, Bose headphones, and also for powering my Raspberry Pi Zero Portable development server. Usually, chargers get warm when using them, it’s currently charging my MBP (which is asleep), this iPad which I’m writing the blog post on, my Apple Watch and my iPhone XS Max. If I touch the charger it’s slightly warm, that’s it. When I was using my MacBook Pro earlier today and charging my Bose headphones, and Nintendo Switch it got a little warmer, but still pleasant to touch. One of the reasons why I wanted this charger is it takes a standard figure of 8 cable, and it’s 110V-240V. That means I can just swap the cable and use it at home in Europe, as well as here in the US (it wasn’t available for purchase in the EU and as I was on my way here it seemed like an opportune moment to get it!). What does it look like? Size wise, similar to my 87W MBP charger – it’s a little longer, but also shorter, thickness and weight wise they feel about the same. It’s space grey, and has one cable coming out of the back for power, and depending on what you want to charge, up to 4 out of the front – that means it can look a little messy but for the price of power I’ll take it! It does have a blue LED on the front, thankfully it’s quite dim and hasn’t disturbed my sleep over the last few nights. That being said, when I get home I’ll put some electrical tape over it – there’s nothing worse than a light when you’re trying to sleep and can’t – it may as well be the eye of Sauron!